Pomaretto is a municipality in the metropolitan City of Turin in the Italian region Piedmont in the Nord West of Italy in the Germanasca valley. Pomaretto has around 1000 inhabitants and it is located at 600 meters above the sea level in the Italian Eastern Alps called Alpi Cozie. A lot of hamlets belong to the municipality of Pomaretto. Aymars, Blegieri, Bocchiardo, Bout, Cerisieri, Faure, Deirine, Rei, Pons and Lausa, are situated on the left bank of the Germanasca creek. While Upper and Lower Chiabriera, Chianavasso, Clot Boulard, Enfous, Gilli, Gran Prà, Soubeiran and Masselli are situated on the right bank of the Germanasca creek. Pomaretto in dialect is called LOU POUMARET. Poum means apple in dialect. As a matter of fact, both in the municipality standard and the coat of arms an apple tree with seven yellow apples is depicted. This is believed to come from the presence, in remote years, of abundance of apple orchards on the territory. The history of Pomaretto is closely interwoven with the history of the Waldensian people who in 1532 joined the Protestant Reformation. Many buildings were built in our small town at that time: the Waldensian Hospital, the Boarding School, the Waldensian Temple and the “Latina” School. The Hospital was opened in 1828 and is currently working with about 30 beds and outpatient activities serving the whole valley. The population, apart from Italian, also speaks “Patouà – Gallo – Romano” which is a form of Occitan language as well as French. All 3 languages are taught at different levels in schools. 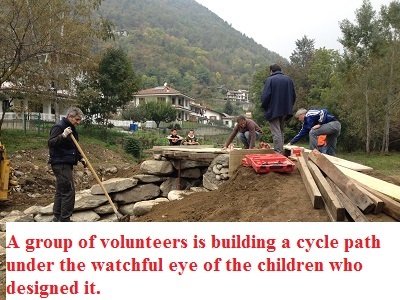 The town administration has always emphasized the importance, in our social life, of associations and voluntary work. These have a key role in our small mountain communities that have a lot to express and to give to the community. As a matter of fact in Pomaretto there are 15 associations. Many have their headquarters in the City Hall, some have emerged recently, others have been working for many years volunteering. Pomaretto’s territory is characterized and well known for its Ramìe vineyards which are on the south-facing slope, starting from the valley floor up to about 800 m above sea level. All the vineyards are built on terraces formed by characteristic dry stone walls. The first documents that refer to the presence of vineyards in our area date back to the fourteenth century. The ALCOTRA project, already financed, will allow us to recover the old “ciabot” (storage equipment) for activities related to the Ramìe wine tasting. – Installation of solar photovoltaic systems (for an overall capacity of 156 kWp). – Substitution of the 280 light bulbs for the street illumination with LED lamps. – Certified insulation work on public buildings. – transformation of the power station supplying district heating into a wood chip thermal power plant. Currently the project “Piupermeno” (Moreforless) that aims at encouraging and grouping together energy redevelopment project for private houses, has started. We’re also planning the building of small hydro electric power plants. In 2017 Pomaretto has represented Italy in the Entente florale Europe competition in Podcetrtek, Slovenia where it has received the silver medal. In 2017 in Spello in Umbria (Italy), one of our sanitation workers, who is also in charge of keeping the green areas in the municipality clean and tidy, has won the “green thumb” prize. Now we can’t wait to participate in “ Communities in Bloom”!! !